What follows is an interview with the author Kevin Brockmeier on the subject of white space. For more information on Kevin Brockmeier, who is, in this reader's opinion, one of the finest young writers around, go to the bottom to read his bio. Follow the links. Buy his books. Laud him as he deserves to be lauded. Let's begin the interview by putting it into context. I attended a reading by you, at the bookstore at which I work. 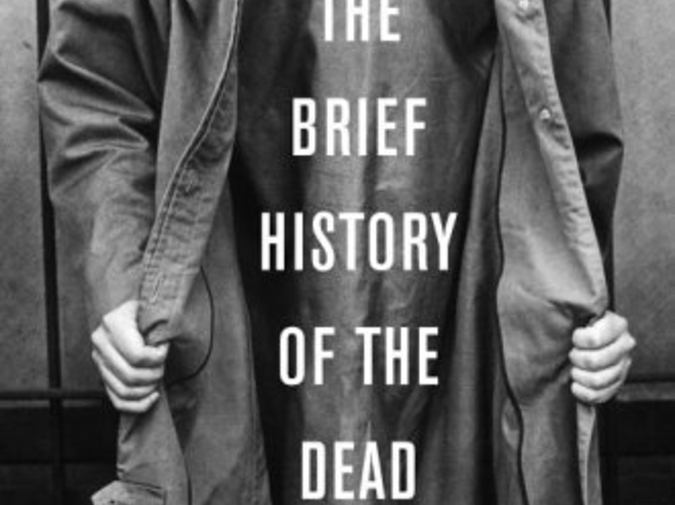 You were reading your latest novel (or, adult novel, I suppose),The Brief History of the Dead, and you did something I'd never seen another reader do. You looked up after a sentence, said "White space," and returned to the text. But you hadn't left the text. You had, in fact, cleaved accurately to the text. I went to grab a copy of the book from the reading's table display, and there it was: a break between the paragraph you had been reading and the one you were currently reading. I've seen others read and come upon a break like that. Sometimes the author will pause for a moment—it's a good time to take a drink of water to clear one's throat. Other authors will move on as if the space was not there. You called attention to it. You made sure to tell listeners that, if they had been reading this passage, they would have come upon a white space. So, the first question is the obvious one: why do you feel inclined to do that? I'm surprised it's that unusual a decision—though now that I think about it, I can't specifically remember hearing another writer do it. I can tell you that it's something I've done ever since my first public reading. It never occurred to me that I might decide to do otherwise. I think it's important to acknowledge the white spaces in my stories because I have chosen them, as deliberately as I've chosen any of the words I use. They seem to me to be a consequential feature of the stories—and not just of their architecture, but of their actual text. Occasionally, in fact, I'll use the white spaces in a story to conduct narrative experiments of one sort or another. In "The Telephone," for instance, in The Truth About Celia, I decided to insert the white spaces at unexpected places—between sentences in a conversation, say, or between the beats of a single action. This was a way, I hoped, of providing the story with a certain fragility, a sense that it could break into separate pieces without warning and at any moment. I'm aware that most readers, even careful ones, won't take any notice of this sort of thing (or at least they won't take conscious notice of it), but I do believe that it can make some small contribution to the overall effect of a story. We can think of a story as a thing occurring between brackets. And then, between the brackets, we can use all sorts of different things to break up the language that is used to tell the story. A sentence has punctuation, both terminal and non-terminal. After a sentence, a line can be broken, a few spaces inserted, and we have a new paragraph. A few paragraphs can be lumped together with a number added to the top of the first, and we have a chapter in a novel, or section in a short story. But, then, there is the white space. There seems to me to be some difference with what white space does, but I'm not entirely sure what it is. Here's a guess. All of those other things that break up text do so in defined ways. They are tools of precision. The white space it not. It is a tool of imprecision. A comma asks a reader to pause. A comma has a physical presence on a page. A white space also asks a read to pause, but only in that it is an area absent of information. May I ask you to react to that hypothesis? On the other hand, a white space, perhaps because it is absent of information, presents itself as something to be understood. Many readers might fail to accept such an invitation, simply hurrying on to the next block of sentences, but I do think the request is implicit every time you encounter one. What a white space most frequently suggests is that some significant current of the narrative is coming to a stop and a new one is beginning. A practiced reader will approach it with that expectation in mind. But it's possible for a writer to subvert the expectation by judiciously placing white spaces at points the reader wouldn't ordinarily anticipate—and it's possible by the same method to indicate that the significant currents in a story are something other than those a reader might have suspected. The other thing to say is that it will often read as an error when a punctuation mark (which, as you say, is a tool of precision) is missing from where it ought to be. I'm not sure a missing white space can ever read as an error in quite the same way, but its presence or absence on the page can certainly give a story a different shape, altering it much more profoundly than a simple missing comma would. I remember noticing this myself when I read two distinctly set versions of Lewis Nordan's story "Sugar Among the Chickens," one in his collection The All-Girl Football Team and one in his selected stories, Sugar Among the Freaks. In the first a number of the white spaces were obscured by their placement at the top or bottom of the page, while in the second they were all plain to see. Not a single word had been changed, and yet I felt as though I was reading two slightly different stories, one of them (the one with the missing white spaces) floating and anecdotal in a way that the other was not. This discussion was prompted by the white space in The Brief History of the Dead. But, to be completely accurate, the white spaces in that book, in fact, have a light gray tilde (~) floating in them. This, I'm assuming, was not your choice, but the choice of the designer who laid out the type for your book. There are many uses for a tilde—in symbolic logic, mathematics, diacritically, etc.—but none of them really indicate a stopping point or sectioning of something. I'm quite fond of it. So, here's a question that is both flippant and serious at the same time: have you objected to the tilde's inclusion in your book and will you be asking for its removal in the paperback? What do you think are the differences between the use of actual white space and the use of a symbol to indicate divisions in a narrative? No, I haven't objected to the use of the tilde, though you're right to assume that it was the designer's decision and not my own. I suppose that symbols must inevitably lend the gaps in a narrative a very slight difference of emphasis, but I think that most readers will interpret the symbols as though they were white spaces, and the change in emphasis won't be much greater than, say, choosing a different typeface would produce. The exception might be a book such as Jeanette Winterson's Sexing the Cherry, in which the text breaks present themselves as a sort of puzzle to be solved, some of them white spaces, some of them pineapples (either whole or halved), and some of them partially peeled bananas (either whole or with the tip chopped off). Also, it's my understanding that the tilde is used in mathematical and logical notation to indicate negation—a symbolic way of saying "there's nothing here"—so you could argue that each tilde is meant to suggest a white space to the reader without employing an actual white space, just as the word "tree" is meant to suggest a tree to the reader without reproducing a tree's real image. In the manuscript versions of some of my early stories I used symbols to divide the sections: a darkened circle, an hourglass, the silhouette of an airplane. But as time passed I came to favor the white space. The great practical advantage of the symbol over the white space is one that I've already hinted at, namely that a symbol won't be obscured by its placement at the top or bottom of a page. The white space, though, has a simplicity and an open-endedness—a receptivity—that I can't help but prefer. I'll add that I've seen a few foreign editions of The Brief History of the Dead, and so far all of them have retained the white spaces in the text without ornamentation, though curiously a couple of them have changed the title of the book—the German edition to The City of the Dead and the Castilian edition to The Brief History of Those Who Are Gone (probably, a Spanish-speaking friend tells me, because the Spanish word for "dead" has "strong corpse implications")—which seems to me a far more radical change to make. Can you expand on what you mean when you say that white space has a "receptivity" that you can't help but prefer? As in, an emptiness that allows itself to be filled in more interesting ways than it would were there a symbol—any symbol—occupying it? Exactly. We're speaking about an issue that's rather abstruse here, and I don't want to make the claim that using a symbol rather than a white space in the gap between two sections of a narrative would reshape anyone's reading of it very dramatically. But I do have the sense that a symbol is ever so slightly more pointed than a white space. A symbol seems as though it wants to guide—or at least nudge—the reader toward something. A white space, on the other hand, has an almost total directionlessness to it. It's my instinct, hazy though it might be, that that directionlessness can encourage a reader to participate a bit more actively in constructing meaning out of the intermission. Perhaps this is a good stopping point, for now. Any final thoughts on white space? Maybe I can end with a quote from Melville? "Therefore, in his other moods, symbolize whatever grand or gracious thing he will by whiteness, no man can deny that in its profoundest idealized significance it calls up a peculiar apparition to the soul." This interview originally appeared on The Reader of Absurdist Books. Matthew Simmons is the interviews editor at Hobart. He is also The Man Who Couldn't Blog. Kevin Brockmeier is the author of a story collection,Things That Fall from the Sky; two novels, The Truth About Celia and The Brief History of the Dead; and two children's novels, City of Names and Grooves: A Kind of Mystery. Here's the website for his latest novel: www.kevinbrockmeier.com.